Casa el Punto is situated just off the beach as close as one can possibly be to the Illawarra's iconic Sandon Point, this exquisite home offers something for any holiday goer. Whether you want to play on the beach, relax, tour, or engage in a mixture of activities, you can do it all here. There are also a multitude of local sights and destinations to visit and/or experience in easy reach. For beach lovers, this beautifully appointed home sits 50 meters across from Sandon Point Beach, with McCauleys/Thirroul beaches to the north, and Bulli/Woonona patrolled beaches except for McCauleys. Plenty of sun, sand, and surf for everyone. One of the best kept secrets of this stretch of adjoining beaches is how tranquil it can be compared to Austi/Thirroul beaches during the summer. Even in the midst of the school holidays, you may find yourself one of just a handful of people strolling along the beach at any given time of the day (except on Sunday mornings if surf school is in session!). For surfers: For the more accomplished, Sandon Point Break is well known for its awesome (and frequent) world class waves. It is a classic right hand point break. Additional choices for depending on your capability and the conditions include Bombie on the opposite side; the Reef (a reef break) about a 200 meters south followed by Peggy's, another righthander. You can check all of these breaks out from the front deck. Just further south is a another whole set of options including Bulli and Woonona, the reef break at Bellambi which has become very popular among the long boarders. If you want the best of everything, accommodation, location, view, amenities, proximity to the beach, and a very custom personalized approach, then..... Casa el Punto is the go! Not your average stripped down holiday rental! This is a fully outfitted home with almost everything available to our guests. Most everything for your stay is provided bath towels, beach towels, linen, comforters, at no additional cost. Use of pantry/refrigerator stocked with all the basic supplies at no extra cost (spices, condiments, sugar, flour, etc). No need to bring these items as you would with most holiday rentals. We even provide the coffee...Nespresso coffee with maybe a visit from George Clooney ;) Please inquire if you are looking for something in particular as we probably already have it. Boogie boards, bicycles, and other gear are available for our guests' use at no extra cost. Forget something? We either have it or can provide it. A food hamper that you specify for your first night's stay can be provided upon request (at cost). *The house has four bedrooms, 1 king bed, 2 queen beds, and 1 double bed, 6-8 adults. *An open plan kitchen, dining (seats 8), and large lounge room with vaulted ceilings, gas fireplace, and fabulous views opening to the front balcony. *Two separate lounge rooms with top-end entertainment systems, 2 large flat screen TVs, DVD/BluRay player, SONOS networked music system, and an extensive music and classic DVD collection. *Wireless NBN broadband internet, Austar/Foxtel TV, 2 iMac computers, and an iPad. *Two full bathrooms and a third separate shower for those coming off the beach, all with continuous hot water. *Two car garage for keeping one car and/or sporting gear. On and off street parking available. *Outdoor BBQ, fenced in backyard. *4 small/medium bicycles with helmets. As a private home, Casa el Punto is not available to hire for large parties and does not allow for any additional guests in the house unless agreed in advance. WEDDING RELATED BOOKINGS will be considered on a case by case basis and need to be discussed in advance. Hard to beat the a day at the beach? Just walk out the front door. Not much to pack up when it's only 50 meters to the sand! Have a picnic on the grass overlooking the beach. A large canopy is available upon request. Go for a jog or a bike ride? A 13km bike track for walking, jogging, and cycling is right outside the front door and hugs the foreshore all the way into Wollongong. We've got bikes and helmets! Enjoy bushwalking? There are some great trails in the local area including a hiking trail up the escarpment to Sublime Point only minutes away. There are three great cafes within short walking distance (less than 1k!) ...The Point Cafe (great food, friendly staff, only 150 meters away), Bulli Beach Cafe (great food, great views, best position), Ruby's (best value and a local favourite). Thirroul Village restaurants and shops are minutes away by car or a relaxing walk along the bike trail. The location is also a great base for a host of other adventures ....Symbio Wildlife Park, Sea Cliff Bridge, Hang gliding at Bald Hill, coastal drive through Royal National Park. Easy day trips to the coastal towns of Shellharbour, Kiama, Jamberoo, and Berry. Take a drive up through MacQuarie pass to Robertson and the Illawarra Fly. ... just kick back with a glass of wine and some canapes on the deck and enjoy the view! The combination of position, views, proximity to sights and services, and all of its amenities makes it hard to beat. For our international visitors, Sydney's CBD is an easy train ride (an hour and 20 minutes) through some picturesque country. Unobstructed view of Sandon Beach looking southeast from front deck. Sandon Point Beach - patrolled section of the beach is 80 meters in front of the house. Wonderful hosts who have thought of everything (beach gear, kitchen utensils and even kids toys). The location is perfect with a cafe a few minutes walk and the beach just across the street. We had a fabulous time and would highly recommend this place to anyone seeking a beach getaway. We've stayed at this fabulous property twice - and that's a first! You'll return too when you experience the instant feeling of coming home as you step in the door. It doesn't feel like a holiday rental, it feels like a holiday HOME. Generous provisions, plenty of cookware (if you are so inclined), beach towels, bikes, boogie boards...and then there's the balcony. Sit back and watch the waves roll in, or walk across the road to the patrolled beach. We'll be back again. We had a fabulous weekend,Michael explained all aspects of the house to us when we arrived and gave pointers for local eateries. 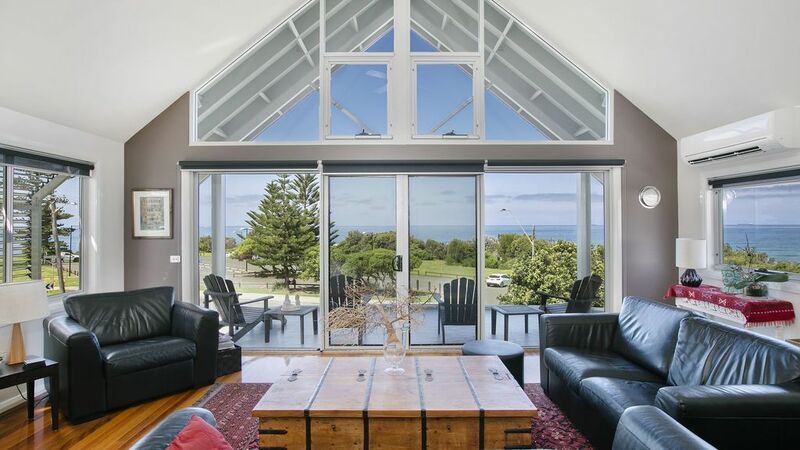 Great views, close to beach and cycleway/walking path. Cofortable space with lots of extra little touches to make the stay memorable. Awesome music system as well :-) Thankyou for sharing your house with us.